Martha, our American Guinea Hog sow, gave birth to eight healthy and strong piglets. She is a great mama, too. We have friends who have a different breed of pigs that gave birth and stepped on more than half of their litter and killed them, so we didn't know what to expect with Martha. We were relieved as we watched her with the piglets. She has been so cautious of them, waiting until every last one of them has cleared her path before she lays down and rolls over to nurse them. We even noticed that she speaks to them with all sorts of different snorts, and it's amazing how they listen to her. When we moved to the farm, we knew we wanted to raise pigs. Because we are all about heritage breeds, and creating systems of sustainable food production, we did quite a bit of research to find the perfect breed for our farm. We purchased a breeding pair of American Guinea Hogs in December 2016. Everything we read about this breed was exactly what we were looking for. They're excellent foragers, have great dispositions, and are good mothers. They don't grow fast, they take about a year, year and a half, to reach full butcher weight and we're okay with that. We don't want any of our animals to spend their lives confined in small spaces, to put on weight at an unnaturally rapid rate, just to feed our family. Cheap and fast almost always sacrifices quality, and we believe that holds true for pork as well. We are going to regard the quality of life our animals live, especially if they provide food for our family. We are beyond thrilled to have a proven boar and sow on the farm and are hopeful this is the first of many litters of piglets. 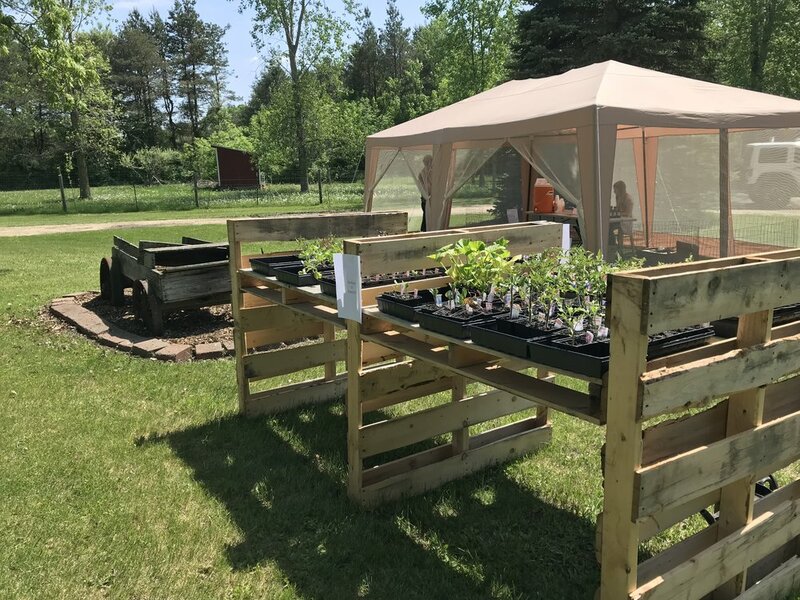 Over Memorial Day weekend, I made a pallet table and we put together a little roadside stand where we sold seedlings and maple syrup. I think the kids enjoyed it the most, and drank more lemonade than they handed out. We got to meet and shake hands with people in our community, and let them know there's officially a new farm in town. It was a great weekend. I turned a small section of our hayfields into a pumpkin patch over this past week. I had to buy a plow off Craigslist because my little garden rototiller just wasn't cutting it. The plow worked great once I figured out how to use it, and I planted, by hand, in 90+ degree weather, in over 250 little hills I made, by hand, over 1,000 pumpkin seeds. Thankful for the rain the past few days that gave me a break by watering it so I didn't have to. Next week, I bale hay. 'Til next time, have a good one!